There is a link to a PDF file at the end of each article. Please inform us about any publications. Sydney, 27th­­ of October 2012. Australian families with young children should live in a house with a backyard. Attitudes are changing and there is a new trend emerging. Hundreds of families are choosing to live in units, with balconies, close to the city or the beaches. These families are seeking a different lifestyle different than the suburban house. The problem is that living at heights has the potential to be dangerous for families with young children. Dr. Danny Cass, a pediatric surgeon at the Westmead Children’s Hospital said recently at a press conference that children’s bedrooms should be a safe sanctuary, but they can become death traps. Dr. Danny Cass is well aware of the dangers heights present to children, having met several victims and their families. Dr. Cass leads a task force formed by the Westmead Children’s Hospital and which includes people from the NSW Health Department, from the NSW Planning Department and from Local Councils. The group’s objective was to conduct a study on falls and to come up with some solutions to this serious issue. As a way to come up with solutions to the problem of falls, the Working Party decided to organize a sub-group involving Industry Leaders, from companies selling products related to improve the safety for children against falls. Amongst the Industry Leader’s invited was Luciana Muratori, owner and director of Safety Nets For Life. The family-operated business sells and installs safety nets used to childproof windows, balconies, stairs or open spaces. Safety nets are a new and innovative concept in safety for children against heights. Mrs Muratori urges families living with children 2 meters or higher off the ground to be aware of the dangers presented by heights and to look for options to childproof their dangerous openings. “There are several products available to childproof windows and balconies. Parents must take the issue very seriously and chose the products that are better suited for their life style”. 1 Part 1 of media conference. Part 2 of media conference. 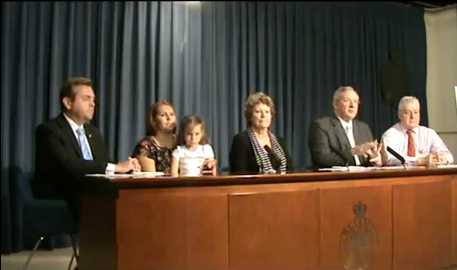 Featuring NSW Planning Minister Brad Hazzard, Health Minister Jillian Ski­ner and Fair Trad­ing Minister Anthonoy Roberts, with mother Mandy Wiegold and daughter Ruby and paediatrician Danny Cass to launch an education campaign to prevent child falls from windows and balconies. A local Sydney businesswoman is helping to protect children from fatal falls. In the past 10 months, 10 children have been hospitalised for falls from windows or balconies in Sydney alone, according to media reports. 1 in 8 families live in flats, units or apartments in the Sydney region, according to latest census figures. Government policies to increase housing density mean this number is likely to increase. Local Mosman mum Luciana Muratori is bringing to Australia cutting edge technology—already used in Brazil, Singapore, USA, Israel and Panama —that will help to prevent these tragedies from occurring. “When we found out how many children get injured or lose their lives every year here in Australia due to falls from windows or balconies we knew we had to do something about it,” Muratori says. 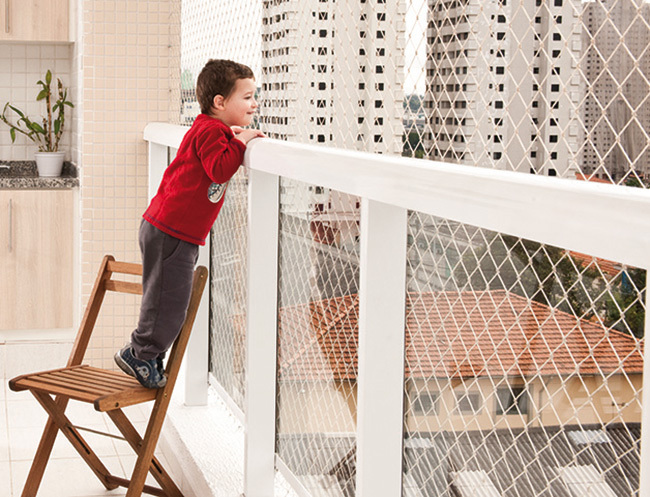 Muratori’s company Safety Nets For Life imports ISO 9002-accredited polyethylene window and balcony nets from Brazil, where they have been commonplace in the urban high-rises of São Paolo and Rio de Janeiro for more than a decade. Muratori, an economist by training, is originally from Brazil. 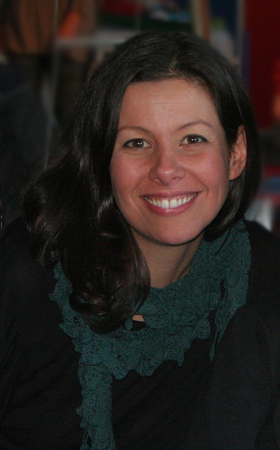 She and her partner Karl moved to Sydney in August 2010 and soon realised that there was a business opportunity here that could help save lives. Safety Nets For Life will donate a percentage of every sale to one of three children’s charity organisations (Save The Children; Humpty Dumpty Foundation; The Allanah and Madeline Foundation). * The Safety Nets For Life nets are made from 100% virgin, high-density polyethylene, treated to resist the sun’s ultraviolet rays, which avoids premature fatigue. * A highly trained team of professionals installs the Safety Nets For Life nets, which create a barrier that prevents falls without blocking the view or giving the claustrophobic feel of bars. * The installation is a quick process and the Safety Nets For Life net can be removed if necessary, although it must be reinstalled by professionals to ensure safety standards are met.